PMC X-Tac 5.56x45mm NATO Ammo M855 62 Grain Green Tip Full Metal Jacket ammo for sale online at cheap discount prices with free shipping available on bulk 5.56mm ammunition only at our online store TargetSportsUSA.com. Target Sports USA carries the entire line of PMC ammunition for sale online with free shipping on bulk ammo including this PMC X-Tac 5.56x45mm NATO Ammo M855 62 Grain Green Tip Full Metal Jacket. 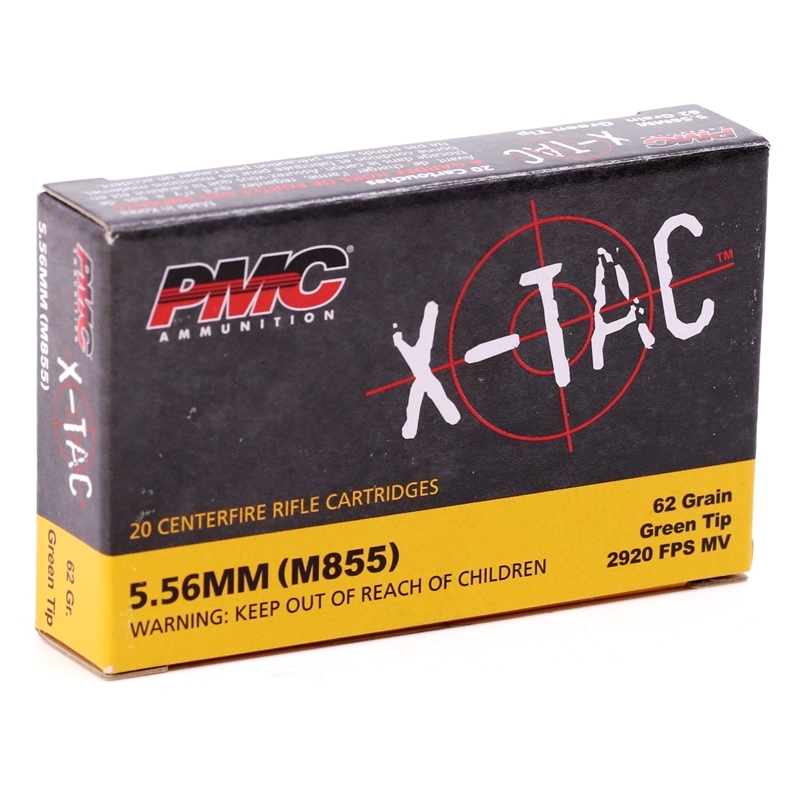 PMC X-Tac 5.56x45mm NATO Ammo M855 62 Grain Green Tip Full Metal Jacket ammo review offers the following information; The X-Tac PMC 5.56mm ammo features a green tip 62 Grain steel core penetrating bullet. This full metal jacket ammo is made with a non-corrosive boxer primer and brand new never fired brass casing. All components are quality controlled in house by PMC to assure you receive a better product with consistently reliable parts. Like all PMC ammo, this X-Tac ammo can be reloaded up to 5 times for those high volume shooters that love to reload their 5.56mm NATO ammunition. X-Tac Green Tip ammo is the perfect choice for target shooting and practice or for personal protection. PMC X-Tac 5.56mm NATO 62 Grain Green Tip Ammo offers an impressive muzzle velocity of 3100 feet per second and muzzle energy of 1323 ft lbs. X-Tac 5.56mm is packaged in boxes of 20 rounds and cases of 1000 rounds (50 boxes of 20 rounds per case). Free shipping is available on bulk orders of this PMC ammo from Target Sports USA. PMC Ammunition produces precision made cartridges with brass and other components manufactured in house, without dependence on outside suppliers. This translates to reliable quality control and top quality ammo that is always compliant with either SAAMI or US Military Specification standards. Between the quality assurance and the great value, PMC ammo can be depended on with each round. Love mild steel core and my rifles like the heavier bullets. No problems with PMC X-Tac 5.56x45mm NATO Ammo. Performs well. heap at TSUSA, ships free in bulk and fast delivery. PMC Ammo for sale at Target Sports USA. Target Sports USA carries and sells online the entire line of PMC Ammunition products including PMC Bronze ammo, PMC Starfire Ammo, PMC X-Tac ammo, PMC X-Tac Match ammo and PMC Shotshell ammunition with free shipping on all bulk PMC ammo. For all your PMC ammo needs, visit TargetSportsUSA.com for the best deals on bulk PMC ammo where shipping is free. Order any case of PMC ammo and shipping is free at Target Sports USA. All PMC products go through an extensive quality control before being processed and packaged, including the PMC Bronze Line ammo. The extended line of PMC Bronze ammo includes the most popular calibers such as PMC 9mm ammo, PMC 223 Remington ammo, PMC 308 Winchester ammo, PMC 45 AUTO ammo, PMC 380 ACP ammo and many others. Most calibers feature a FMJ bullet, non-corrosive primers and brass casings to ensure smooth feeding and great accuracy. With the high volume shooter in mind, the PMC Bronze ammo line is relatively inexpensive and affordable. The PMC X-Tac ammo line was designed for those individuals that put their lives on the line to protect and save others. Tested and used my the military and law enforcement individuals throughout the world, PMC X-Tac line is the prefered choice of ammo in the following calibers; PMC X-TAC 5.56mm NATO ammo, both in a 55 Gran FMJ lead core bullet and 5.56mm NATO ammo 62 Grain steel core (green tip) bullet. As for the personal protection ammo line, PMC Ammunition offers the PMC Starfire ammo line in the following handgun calibers; PMC Starfire 357 magnum ammo, PMC Starfire 38 Special ammo, PMC Starfire 380 ACP AUTO ammo, PMC Starfire, 40 S&W ammo, PMC Starfire 44 Remington Magnum ammo, PMC Starfire 45 ACP AUTO ammo and PMC Starfire 9mm ammo. Order any case of PMC bulk ammo and receive free shipping from Target Sports USA.